Video installation projected on the 80 meter high columns of the Gothic Saint-Martins cathedral . The video is about our mental desire for infinity. We experience in Vanheule video of Infinity a return to an origin we can’t grasp. 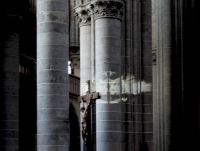 This effect would be incomplete if the image, with its ability to “swallow us up”, did not appear alongside a column of a Cathedral, because it sure intensifies the petrifying effect of the video. The blackness of the forms and the chaotic way they are arranged recall the residue produced by the fire faces from hell or the eternal light from the free spirit. The viewer finds himself facing not only the power of a free spirit and the force of fire, but also the darker side of his own being. Her work takes us inside ourselves, as if we were endlessly swallowing all our inner shadows and deepening their impenetrable density.